This is an important concept. In addition to training troops in your Castle, you can also win Units. In Battlegrounds, you will engage a site infested with Orcs using either offense or defense forces, depending on the type of Battleground. You may have noticed that on average one in every 3 to 5 Battlegrounds gives you a reasonable reward back in troops. Often, this reward comes in the form of Units that you cannot train yourself. For instance, when you start you throw Pikemen into a Battleground, you might get Paladins or Knights back. The total strength in offense points might be the same as the larger amount of Pikemen you sent to fight at the Battlegrounds, but as we established earlier, the higher-level troops eat a lot less and are easier to maintain in the long run. The same logic applies to other more advanced Units you might be rewarded with, such as Dragons, Warlocks, Griffins, Demons and so on. Those are even better, as these are Units that you cannot currently train and will likely not be able to train anytime soon – at least for the next week or month! These are very desirable troops, simply because they are powerful and you can have more of them in your Castle walls without running your Farms dry - and since you can’t train them, you’ll need to win them. The good news is that you can win them from Battlegrounds by using the cheaper Units that you CAN train. This is where your Pikemen and Archers - and later Paladins, Nomads and Knights –are needed. You train more of them every day and many of them will be sacrificed in a Battleground. In exchange, you get Experience Points, and sometimes you also get better troops (Cavalry/ Occult/ Bestiary) as a reward. Then build more low-level troops and repeat the process. This is how you improve the quality of your army by filling your ranks with Occult and Bestiary troops - and you will level your Castle up while doing so! In summary: your best strategy is to spend your time and Resources to unlock the cheapest troops (Archer and Pikeman) and make them as strong as possible (by increasing the relevant Lost Art levels) and quick to build (by applying Skull Runes in the Obelisk of Power), and then train as many as possible, constantly. Send them all to the Battlegrounds in exchange for Experience Points and better types of troops, which you would otherwise likely be unable to train for some time. This is the trick. Alright, now on to the extra features. As you will learn in the game (probably around the time you reach level 15), that there are additional Infantry units called Wraiths. You will build a building with a green glow called the Crypt. You will be able to summon Wraiths there. Initially, you can summon 3 Wraiths from your friends. Yes, that’s right - I said you can summon Wraiths from your friends. So here is one advantage to making your fellow League members your Facebook friends. They need to be Facebook friends AND play this game in order for you to be able to summon a Wraith in their name. By default, you can summon 3 Wraiths every day, for up to 50 total (actually, you can eventually have more than 50 total, but not until you reach a certain level, so for simplicity’s sake let’s just say 50 for now). 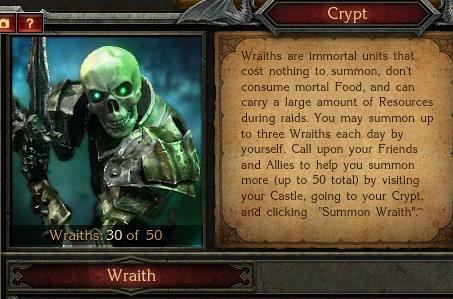 If you wish to summon more than 3 Wraiths per day, you will need to buy Coffins. They are listed under the construction menu as Improvements for your Castle. Each Coffin costs 200 Sapphires and you can buy a maximum of 22 of them. It is up to you to decide how many Coffins are worth it. On top of that, your Facebook friends who also play this game can visit your Castle and raise another wraith for you (this is another way for you to get more than the daily 3 Wraiths you can raise yourself by default). Wraiths are good Units to have in your ranks. They travel at a speed of 12 mph and they are good at both offense and defense. Their offense strength is 50 (in this sense they are comparable to the Pikemen) and their defense is 60 against all types of troops (about as effective as 2 maximum strength Archers ). And best of all, they are free! They do not consume Food! And you can build at least 3 of them each day! You should always have some Wraiths inside your Castle as extra guards. If they get destroyed, it is no major loss, as they were free and they are bound to take down 1 or two of the attacking troops with them. You can also use them in Battlegrounds or for whatever military maneuvers you like. Be sure to summon as many as you can every day, and when you can’t summon any more of them, send them to fight at a Battleground and summon yourself new ones. Deploy them for offense or defense at any location and opportunity. They are free, so take advantage of them! As we established above, the way to get better troops is to sacrifice your lower-level Infantry (and maybe some Cavalry, if you can build them) in Battlegrounds and hope for rewards. So you need some basic advice on clearing out Battlegrounds (“Battleground” is hereinafter sometimes abbreviated to “BG”). There will be more on Battleground dynamics later, but I feel that to strengthen your army you need to be engaging Battlegrounds, and there is some general advice I can give you to start with that will help you without going over your head. When you first engage Battlegrounds, it is because the game tutorial quests ask you to attack one. You first attack one of level 1, and then the game asks you to attack a level 2 BG, a level 3 BG, and so forth. However, very soon, you will have the Eagle’s Nest building and you will see that you have multiple Battlegrounds available to you through this interface, of various levels. You should see two of the highest level you are at currently, and several BGs at lower levels. My advice is this: keep the highest Battlegrounds you have in your Eagle’s Nest at Level 10, and only engage the sites of lower levels. Just let the level 10 BGs sit there and hit everything below them. Here is the reasoning: the amount of troops you can train in a day gives you the possibility to attack a few Battlegrounds of these lower levels each day. This is more fun and rewarding than building up armies for a week, month, or more and hoping to take down one of the big Battlegrounds. The next reason is that you get Experience Points for each Battleground you clear. The amount of Points you score increases as the level of the Battleground increases - as you would expect, of course. However, if you take into account how many Archers and/or Pikemen you need to sacrifice to earn those Points, you will see that the lower levels give you much return! Furthermore, for those times when special quests take place, wherein you have x days to collect items from Battlegrounds, it is good to know that you can get 1 item per battleground cleared all the way up to level 12. And you can imagine that it is easier to clear a few level 5 Battlegrounds than to clear a few level 12 Battlegrounds and still receive the same amount of items collected! For a level 14 Battleground, you would get 2 items for the quest, but you could just as easily complete two level 10 Battlegrounds, lose the same amount of troops, receive the same 2 items and get more Experience Points for doing so. Or you could do four level 7 Battlegrounds and get 4 items, [KB2] and even more Experience Points and a decent chance of getting some high-level Units, as a reward. So for now, my advice remains to leave the highest level Battlegrounds alone and focus on conquering the Battlegrounds of the lower levels. Sooner or later, you will realize that your troops are strong enough in numbers and strength (and when your production capacity has increased to the point where you can train and use more troops). At that point, you can move your Battleground levels up to level 14, for instance, and so on. I know it is tempting to progress through the Battleground levels as quickly as possible because the game asks you to do that (the quests from the red icon with swords on the left of your screen), and it rewards you extra Experience Points, but ignore those quests for now (you can of course do those until you reach BG level 10). You will gain those Experience Points faster doing more lower level Battlegrounds, and the quests will still be there when you are ready for them later. This is an example of the Eagle’s Nest interface showing a few Battlegrounds. The two on the top are offensive Battlegrounds, so we throw Pikemen at those. The two on the bottom are defensive Battlegrounds, so we throw Archers at those. How many troops do you need for a Battleground? You probably know that as the Battleground level increases, you will need more and more troops to conquer it. Let’s assume we have only Pikemen and Archers to play with for now, and that you have managed to upgrade both the relevant Lost Arts up to level 20. Keep in mind that the numbers below are a rule of thumb only, to help you estimate how how strong an army you should send to clear the Battlefround (if you lose with these numbers it means there are only very few Orcs left in the Battleground and you can finish it off relatively easily by throwing a few more Units at them). These are just averages. I have also put in the levels 10 and 11 just to illustrate to you the amount of troops needed to clear the Battleground (and thus, the amount you’ll need to train every day when engaging these locations) increases dramatically after level 10. April 2016 edit: I made these estimates quite a while ago, but they should be close enough to be relevant. I usually throw an extra 10% on top of these estimates at the Battlegrounds. As you can see, the numbers for Archers are about double those for Pikemen, simply because a Pikeman is twice as strong in offensive power as an archer is in defensive power, and also costs more time and Resources to train. This should also make it easier to remember for you. Let’s just say the game favors offensive troops slightly when considering the amount of power and Food consumption to build your army. When you engage a defensive Battleground, you will see what enemies are there, and if you don’t manage to clear it out the first time, the Battle Report will show you how many Orcish troops are still left there. For the offensive Battlegrounds, it will not tell you outright, however, the report you get will have a certain color (red= you are not even close, orange = you are 40% there, yellow = there is between 30% and 1% still to go). So you do have some indication of your progress. Example of a lost Battleground. It was an offensive Battleground of level 7, so I threw 20 Pikemen at it. 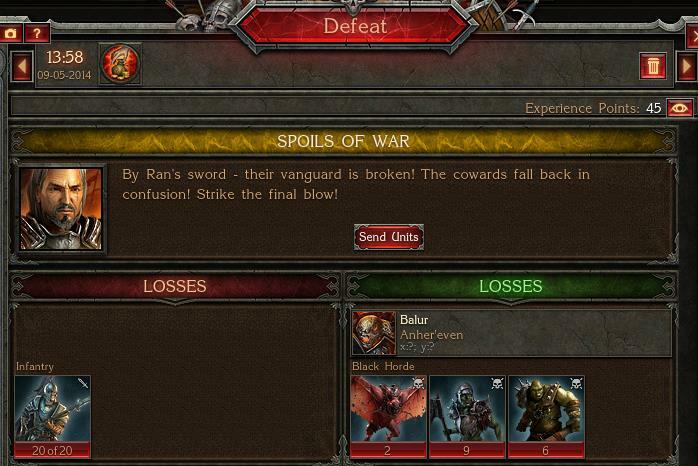 They lost (hence “Defeat”) and you can see what troops they destroyed on Balur’s side. 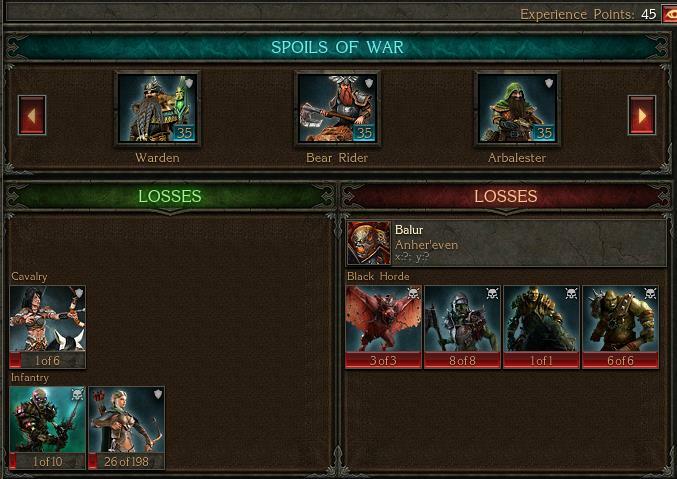 Notice the yellow bar in the middle where it says “Spoils of War” - this tells us we have almost won and there are not many Orcs left. Another thing to notice, in the top right corner, is the 45 Experience Points we got by sacrificing 20 Pikemen. If you conquer a level 30 Battleground, you will only get 100 points for killing 200 Pikemen. As you can see, there is quite a difference in the yield. Let’s discuss the basics of Battleground rewards. On average, the Units you get as rewards amount to about 80 to 98% of what you put into the Battlegrounds (the values here are expressed in terms of the Resources used to train the Units, rather than in the offense/defense statistics of the Units). So you throw 12 Pikemen at a Battleground, and you get 1 Knight back. That Knight would have cost you the same amount of Resources as 10 Pikemen to train, and has the strength of 7 Pikemen, but eats like only 2 Pikemen. Assuming you could not build Knights in the first place, this still makes your army stronger. Very nice indeed! This was just an example; you will receive all kinds of Units as rewards, as you will see. Go ahead and start collecting a variety of troops from the Battlegrounds. Just remember not every single Battleground will give you Units as a reward for clearing it – but if you don’t get any, it does not matter, as your losses will be factored into your eventual reward, so it will result in an even better reward at the next Battleground that you receive Units from (this is called “banking the Battlegrounds” by many players, and the losses that you build up are often referred to as your “reward bank”). This was a level 7 defensive Battleground. I threw a few more troops at it and won. The losses on my side translate to about 35 Archers. My winnings are 45 Experience Points and 105 assorted mountain Dwarves! At this level of Battleground, you do not have to worry about strategies for how to best engage them, as you can still build only Infantry (and at some point also Cavalry) and those will be your preferred choice to conquer the Battlegrounds with for quite some time. Later, there will be strategies according to how many Units of each kind Balur has stationed at the Battleground, and which type of Unit would be best suited to go after them. But Pikemen and Archers are good all-round troops, together with the occasional Wraith, and later you will add some Nomads and Knights to the mix. In the above estimates for the amounts of troops required to clear Battlegrounds, just count 1 Nomad as 7 Archers and 1 Knight as 7 Pikemen for now. One Wraith should be counted as 1 Pikeman or 2 Archers. More advanced and higher level Battlegrounds will be discussed later. We have kept this out of here for the moment because we have seen so many people progressing through their Battleground levels so quickly only to discover that they are left with a lot of very high-level Battlegrounds in their Eagle’s Nest and no lower ones to quickly clear, and thus must train armies for very long periods of time to be able to conquer a single one. We also see players losing all their troops they have because they were unlucky enough to engage 5 high-level Battlegrounds in a row and get no rewards back, until their whole army was gone. We have seen this happen with players of all levels, from level 20 to level 80, and they were left with the daunting task of rebuilding their forces from scratch. At level 20, that is only a few days building, but at level 60 you will be building Pikemen and Archers seemingly forever! These are some of the reasons why it pays off to keep the Battleground level low, at least for the time being, and focus on training more lower-end troops, strengthening them, and completing more Battlegrounds of lower levels while you level up. K = thousand, like it signifies in Kilograms (kg). Used when talking about large amounts of points or Resources, and not wanting to type so many zeroes. 10K = 10,000. I hope you have grasped the reasoning behind all this, and how it led up to some strategic decisions which not everybody would make, but will surely result in profits for you. Also, be sure to understand that there are a lot more aspects and nuances to this game than were discussed here; to truly excel, you’ll be required to learn and build many other things on top of what was discussed in these guides. This was meant to focus on the ways to make your army strong right from the beginning and at “lower” Castle levels. We will discuss other sides of the story as well! Follow these strategies, and you will see that it pays off. Good luck building yourself an ever stronger army!!! My name is Bob Cornelissen and I have been playing this game for a few years now. I have been a long time Officer and Marshall in the League called “Dragon Raider”. Check us out if you are looking for a nice League where you can learn much more! Join Bob and his team, play Stormfall: Age of War now!